· Clean the fish and cut into small pieces. 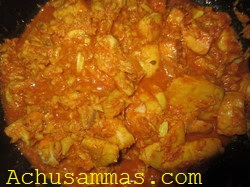 · Make a paste of red chilli powder, turmeric powder, ginger and tamarind paste. · Take a pan (using clay pot is better ) and add the above paste with ½ cup water. · When these mixture starts to boil add the fish and close the lid cook for medium heat. · Meanwhile crush the grated coconut and garlic. · Once fish is cooked open the lid, and add the crushed garlic coconut mixture. · Cook for further 5-10 minutes without the lid, until gravy thickens. · Add curry leaves and oil just before switch off stove. Delicious curry.. What a co-incidence.. Today fish at home for lunch. 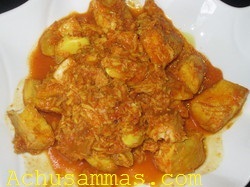 What a delicious fish curry!! I'm drooling! Cannot wait to try this recipe. I like it very much! Many thanks for sharing your recipe with us. Is one of my favourite.